Marinate the steak in half the soy sauce, garlic and 2 tablespoons of lime juice in a bowl for 10 minutes. Cook the steak on a preheated grill pan for 1-2 minutes either side. Put aside. Steam the broccoli in a steamer or colander set over a saucepan of boiling water for 5-6 minutes, then set aside to cool for 10 minutes. Combine cooled broccoli with mint, basil, coriander and cucumber. Slice the steak and add the broccoli mixture. 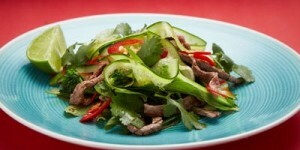 Combine chillies, sugar and the remaining soy sauce with the lime juice then pour over the salad.